Before I get to today’s lunch I wanted to give readers a little bit of background information about school lunch in the United States. Many, if not most, public schools in this country participate in the National School Lunch Program (NSPL) run by the United States Department of Agriculture (USDA). Many not-for-profit private schools use this program as well. The NSPL estimates it feeds about 31 million children under the age of 18, many of them for free. From what I understand, the USDA gives food as well as monetary subsidies to schools participating NSPL. However, the federal government is NOT picking out the meals for every school. The USDA sets guidelines every school must follow. 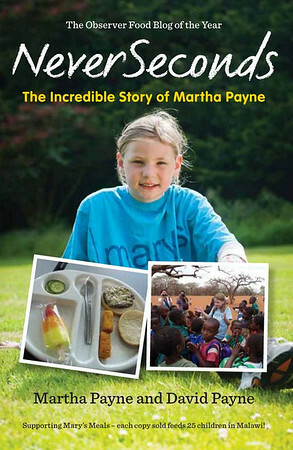 This school year (2012-2013) the USDA increased the amount of fruit and vegetable servings children must receive. They also made changes to incorporate more whole grains into lunches, and set sodium limits. There are food vendors approved by the USDA that school districts can use to buy the food for lunches. Schools can also receive “bonus” foods from the USDA when there is an agricultural surplus. 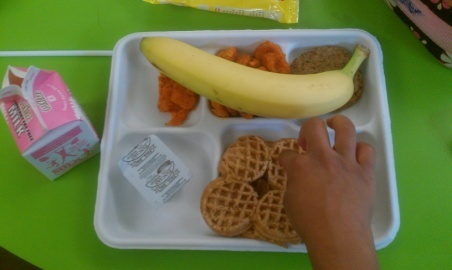 Today at our school we had “Brunch for Lunch,” Lunch servings included mini whole grain maple flavored waffles, sweet potato bites, turkey sausage, milk, and a banana. 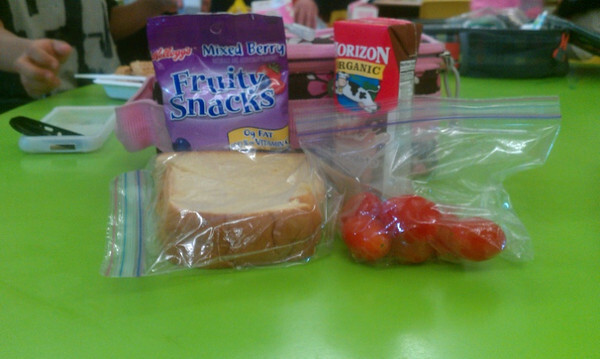 Zee was very, very excited to get school lunch. He is one enthusiastic kid. But, Sunflower brought her own lunch from home. She was also happy with her meal. Zee drank about half his milk. I ended up wearing the rest of it. Mouthfuls: We’re not sure, but I think my clothes contain at least 10 sips. Recess: Indoors in the gymnasium. We played games with the giant parachute. Ms El - how'd you end up wearing the milk? did Zee knock it over while eating? were you asking him if he liked the milk as he was drinking it and he exclaimed "YES" while throwing his hands up in the air and then the milk flew out of the carton? Kids alway amaze me in the US on what they find healthy. Not that whole grain waffles aren't. You did well telling him no on more syrup - probably best to keep it to a serving. Wish he had wanted the sausage. I have a feeling he is going to be quite hungry when he gets home after not eating a lot of his lunch. Also, it's sad that there is so much food waste. Long Island- I hope you are all safe as the storm comes ashore. Was this report Friday's lunch? I think all of the NYC schools are closed today.